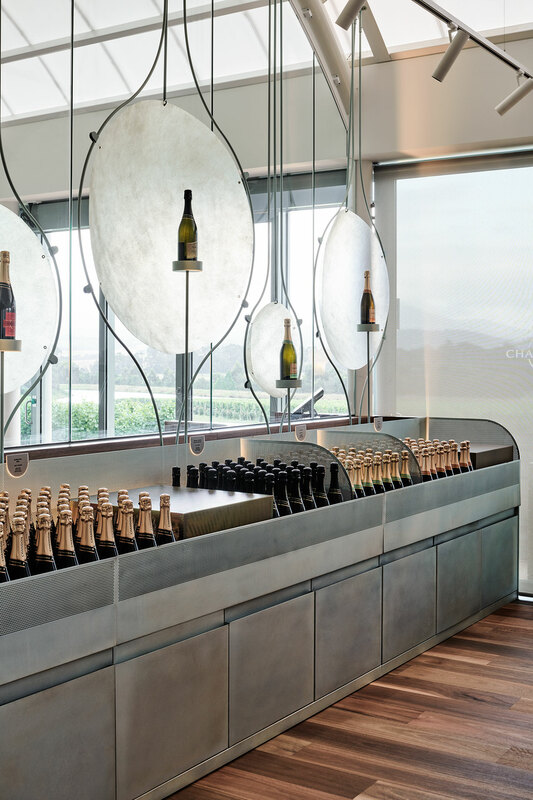 Established by eminent champagne house Moët & Chandon in Australia’s Yarra Valley, one of the world's premier wine growing areas, Domaine Chandon has been making méthode traditionelle sparkling wine—namely champagne, just not from Champagne in France—for over thirty years. 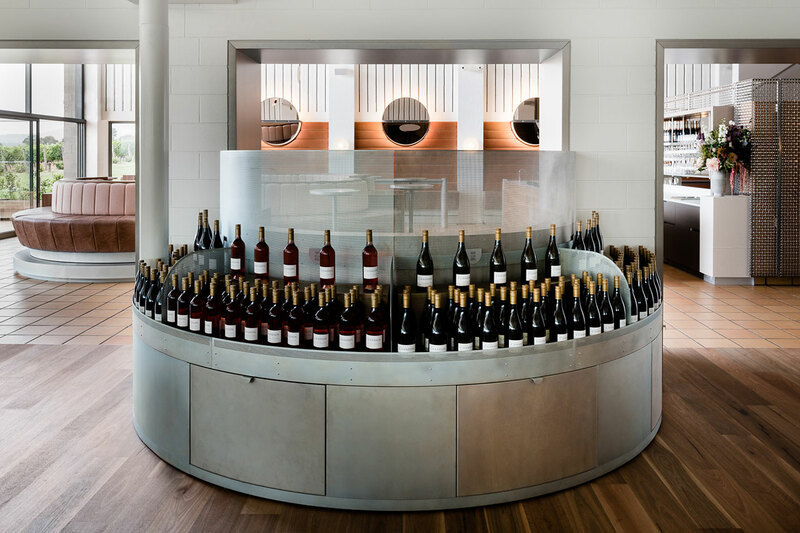 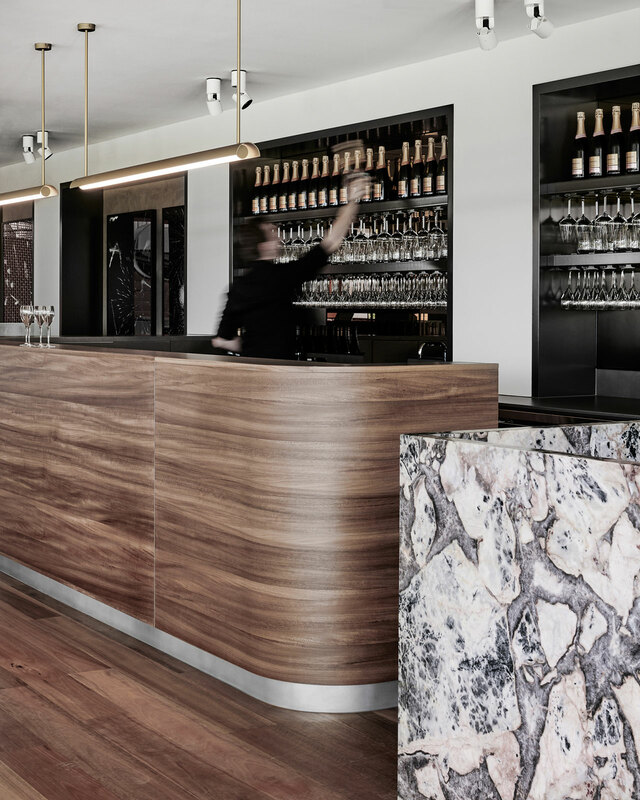 Located amidst lush verdant vineyards that stretch as far as the eye can see, the winery’s scenic setting is elegantly complemented by its refined interiors, recently renovated by Melbourne-based, interior architecture and design practice Foolscap Studio as a reflection of both the luxuriance and the effervescence of the premium sparkling wines produced on the premises. 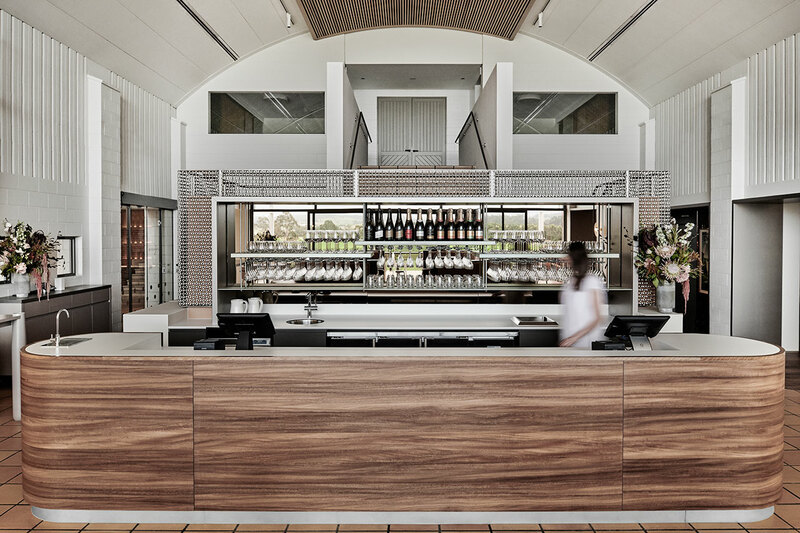 Working with an existing 1980s industrial structure, a voluminous composition of barrel vaults, the brief was to create an immersive brand experience across the winery’s bar, dining, wine-tasting and retail areas, which the designers have accomplished through the combination of a Parisian bistro aesthetic that channels Chandon’s French heritage and a contemporary youthfulness reflecting the outpost’s New World context. 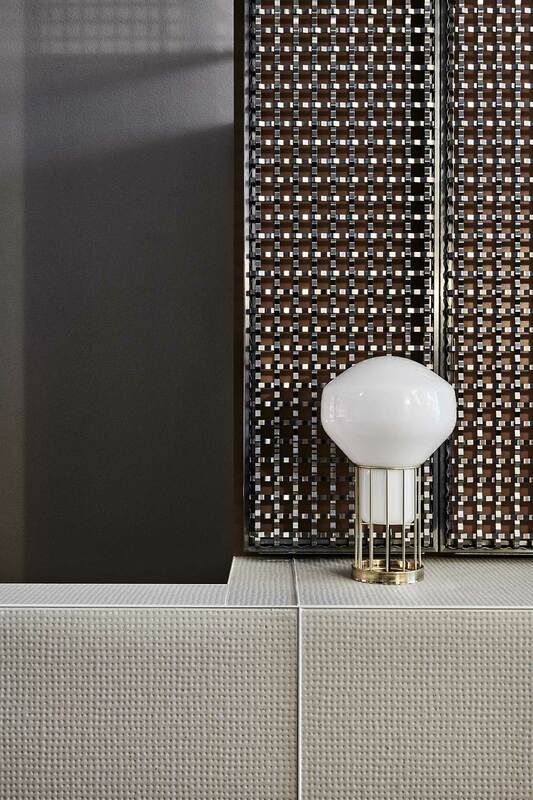 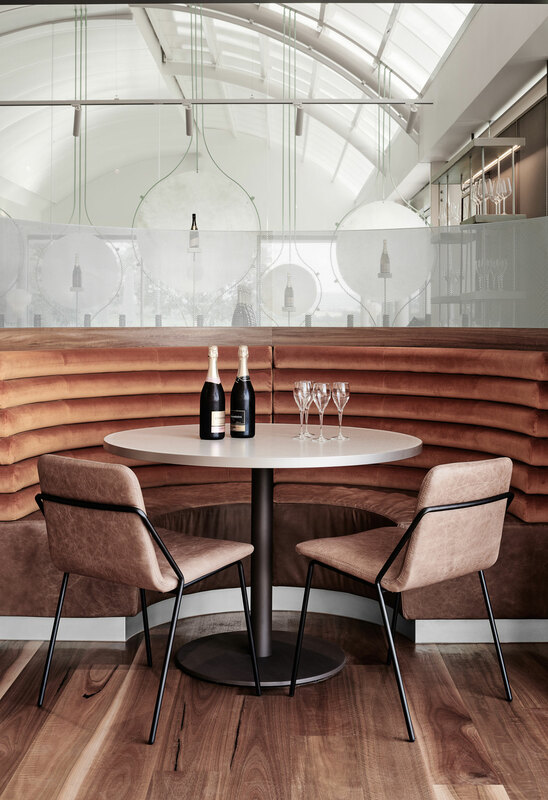 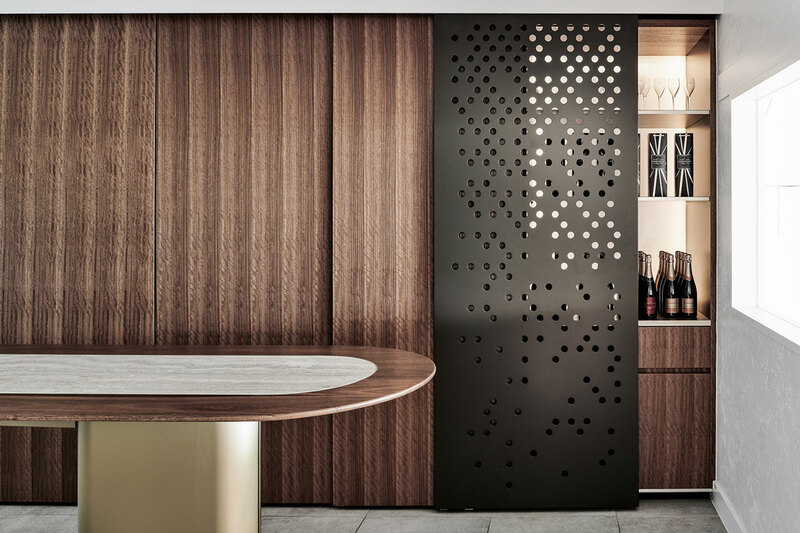 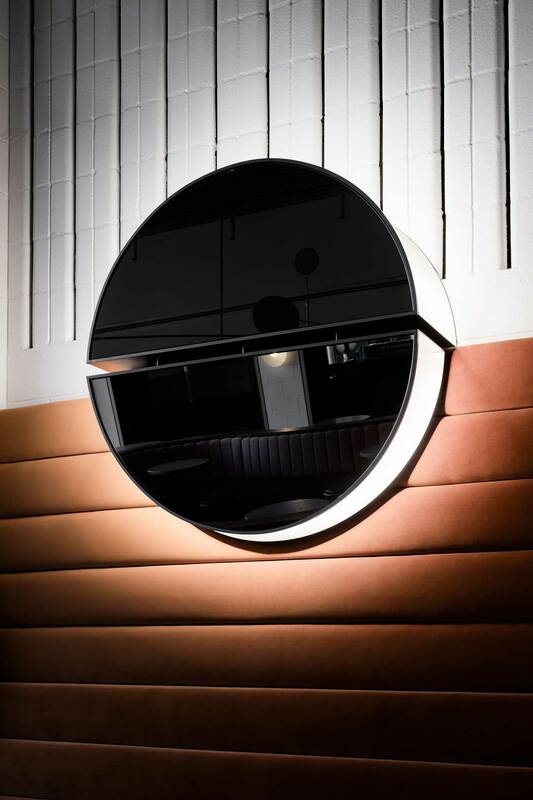 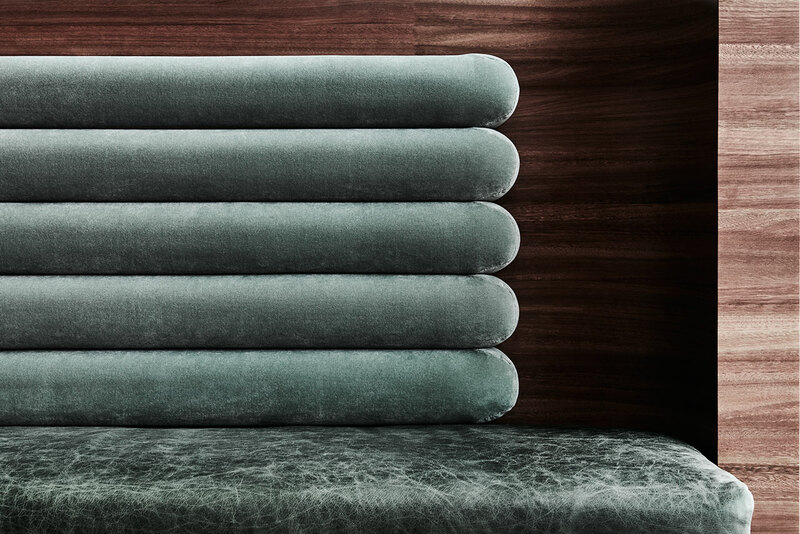 Inspired by the almost alchemical transformation of grapes into sparkling wine, the designers have chosen an eclectic palette of natural materials such as metal, marble, leather and wood, which they have then subjected to various treatments that reflect the passage of time and the exertion of fine craftsmanship. 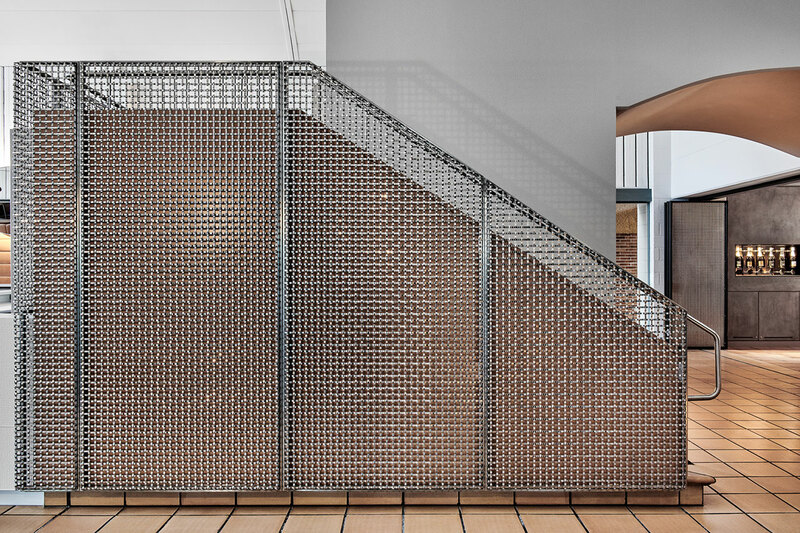 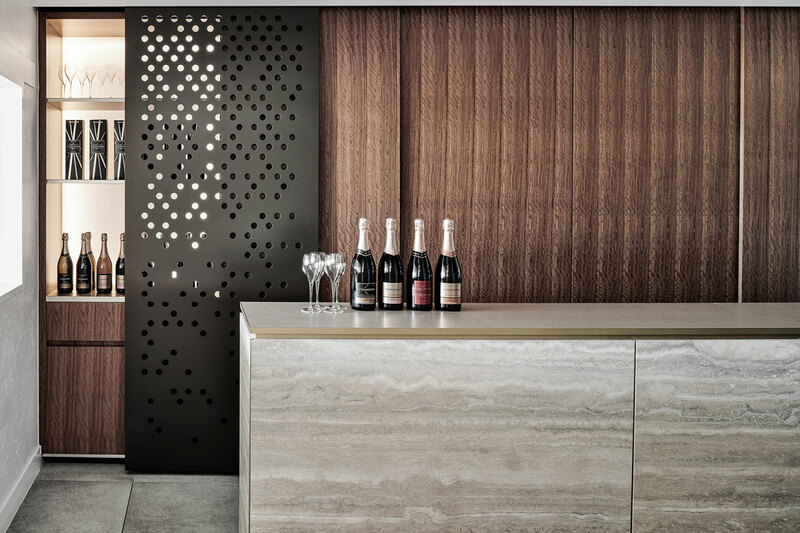 Metal in particular, the primal matter that alchemists vied to purify into gold, is present throughout the spaces in a variety of textures and finishes; from the finely perforated stands in the retail area to the irregularly punctured screens in the wine tasting bar, and from slim, curved joinery of decorative displays to delicately woven mesh sheets that playfully tiptoe between opaqueness and transparency. 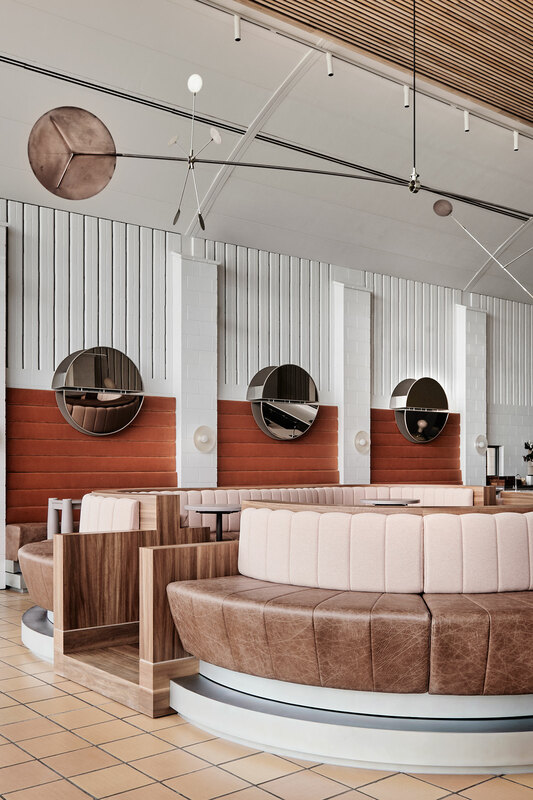 Undoubtedly, the designers’ most playful metallic elements has to be the suspended kinetic sculpture that dominates the lounge-bar area, a bright, double-height space that the visitors are greeted by when they enter the building. 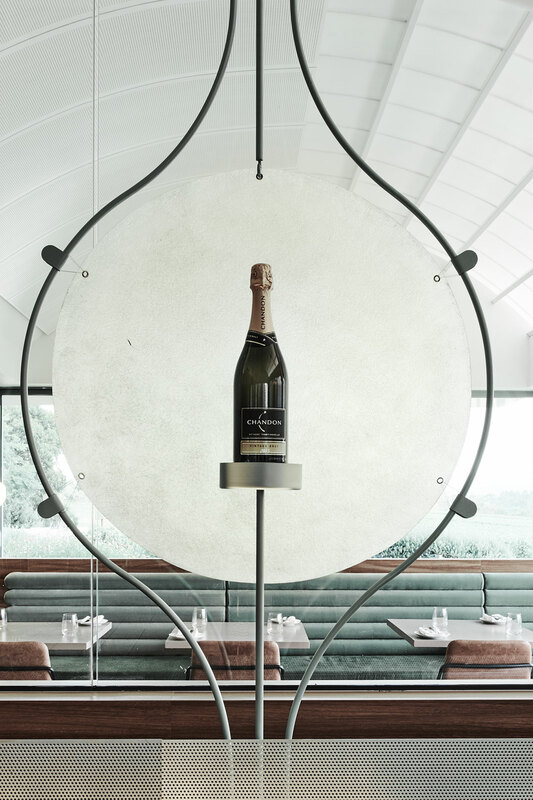 Developed in collaboration with local metal craftsmen and reminiscent of Alexander Calder’s “mobiles”, the artwork gently bobs in a constantly changing choreography that brings to mind the unpredictable nature of bubbles. 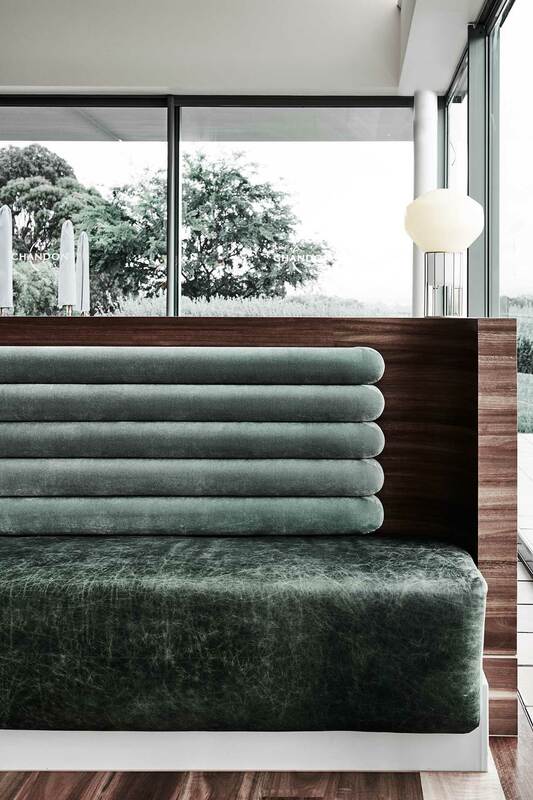 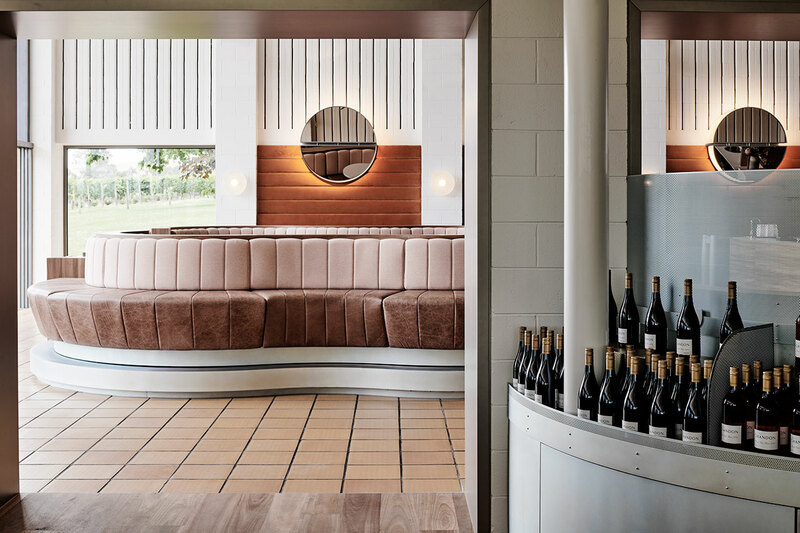 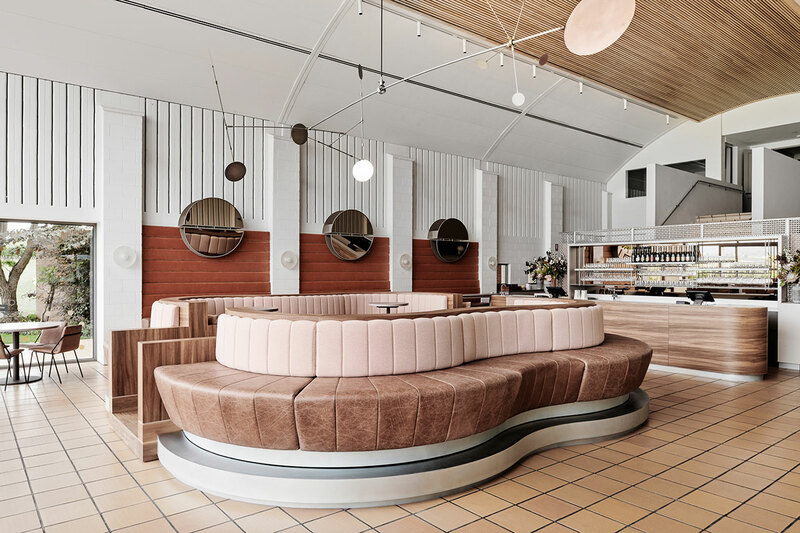 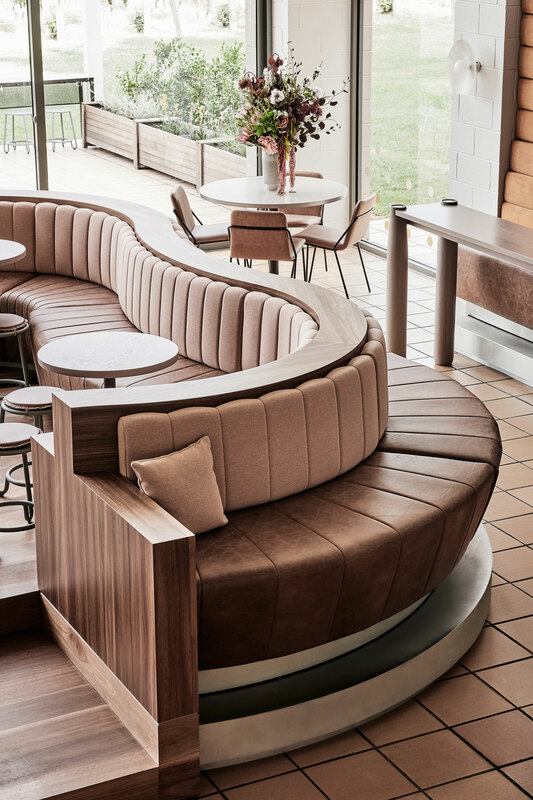 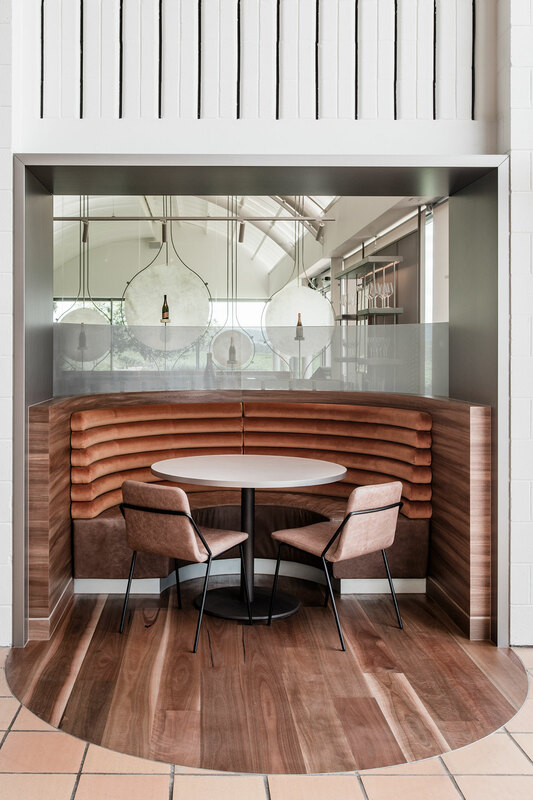 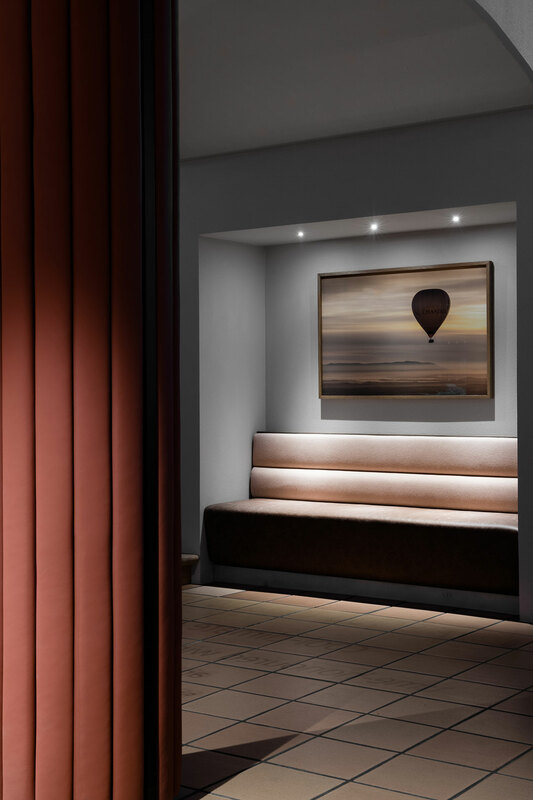 Its dynamic lightness hovers in juxtaposition with the organically shaped, raised banquette below it, whose suede and weathered leather seating and Spotted Gum timber structure evince an earthy sensuality. 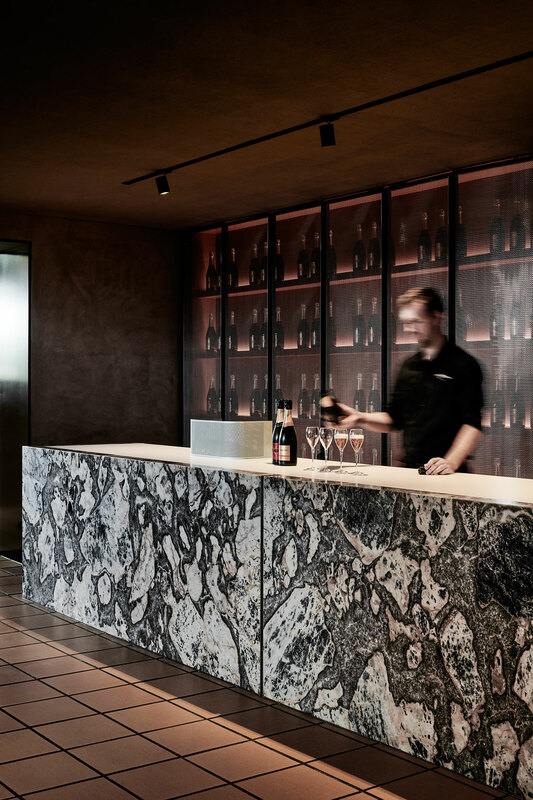 Whereas the entrance lounge is bright exuberant space with wide views over the surrounding landscape courtesy of the floor-to-ceiling glazing, the wine-tasting room is conceived as a more enclosed, intimate and darker space, a deliberate contrast that alludes to the ‘Compression/Release’ process of bottling and opening a bottle of champagne. 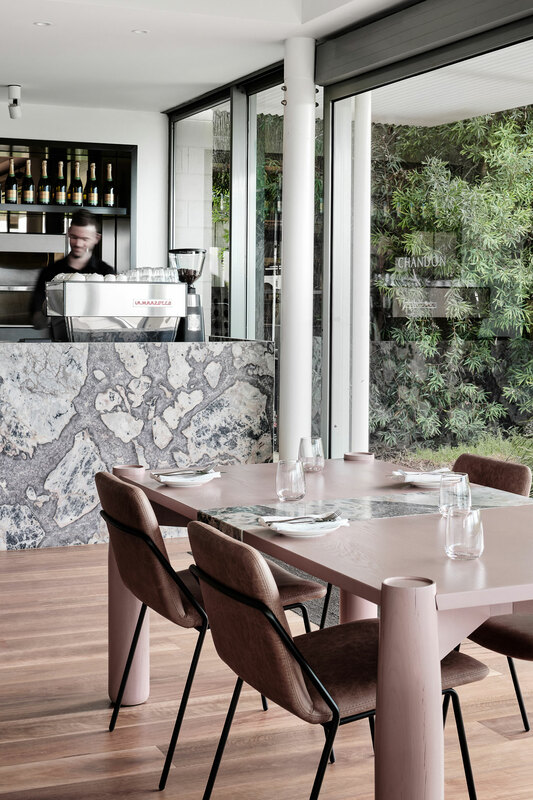 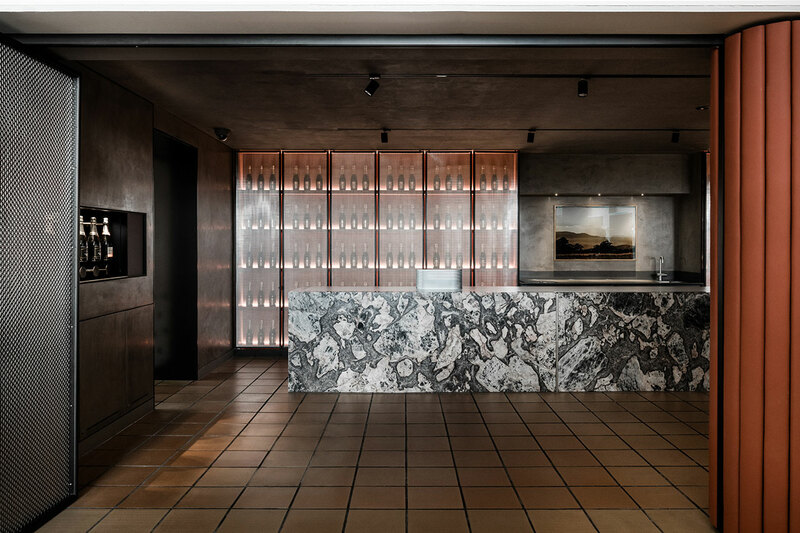 Enveloped by dark grey, wall-washed walls and dimly lit display shelving, the focus of the room becomes the long bar counter of Queensland ‘Dreamtime’ marble whose mesmeric texture is captivating. 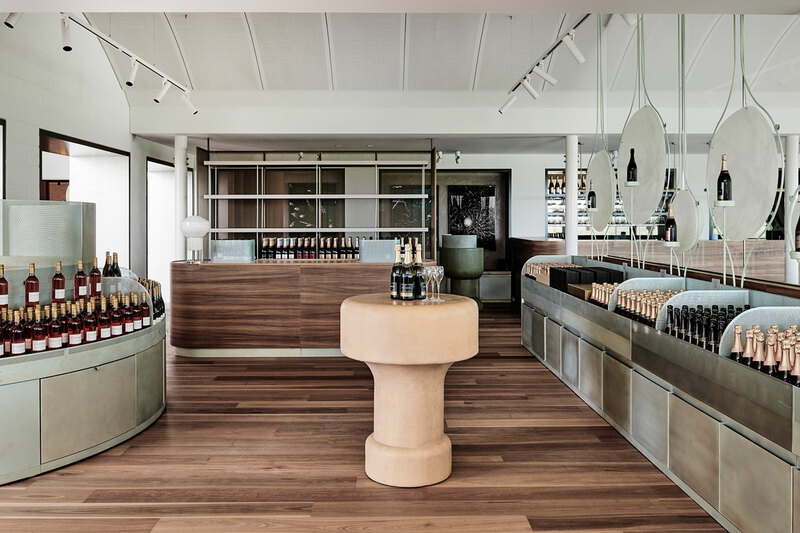 For the retail area, the designers have again worked with local manufacturers to create a bespoke display system featuring framed, up-lit fibreglass screens, portable plinths playfully shaped as bottle corks, and slender sculptural joinery, as well as semicircular bottle display stands reflecting the barrel vaults above. 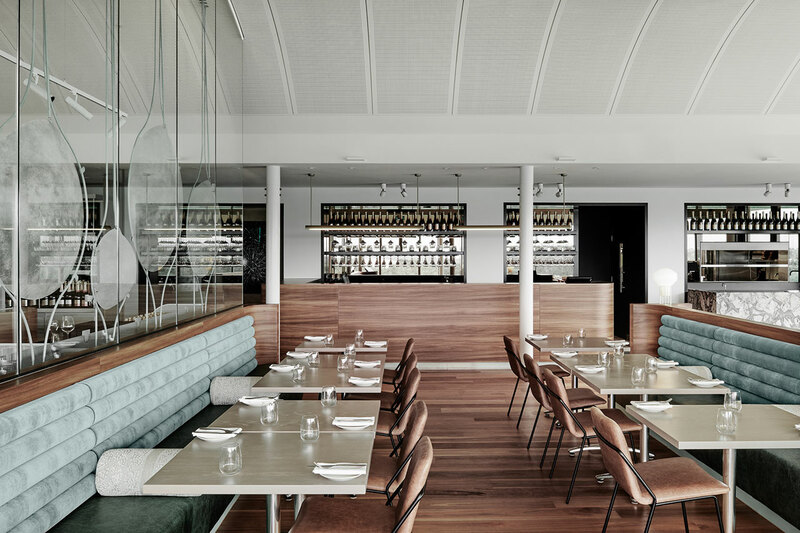 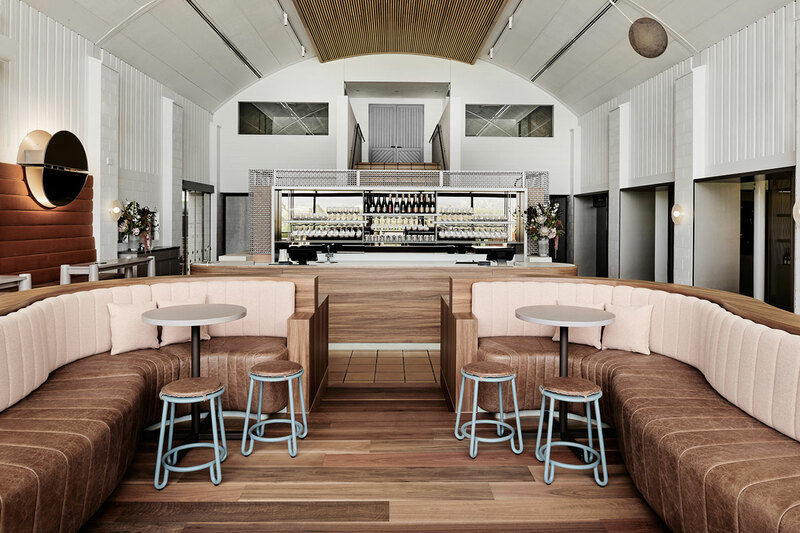 The venue is completed by the brasserie next door whose design is an eclectic amalgamation of several elements that can be found in the other three spaces such as the banquette seating in suede and weathered leather, albeit in green hues instead of the lounge’s brown and beige, the cork-shaped fibreglass service station and the Spotted Gum timber flooring and joinery. 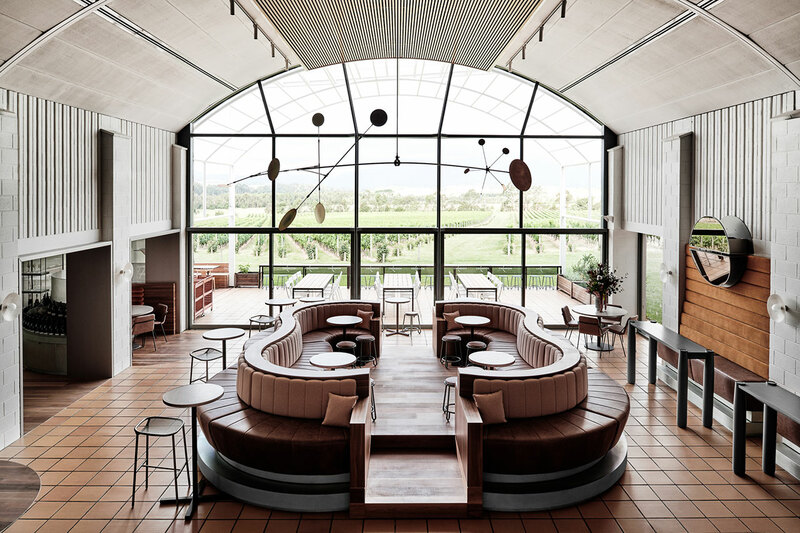 Similarly to the bar-lounge area, this space also offers sweeping views of the estate's vineyards which visitors can enjoy while sipping a glass of fine wine. 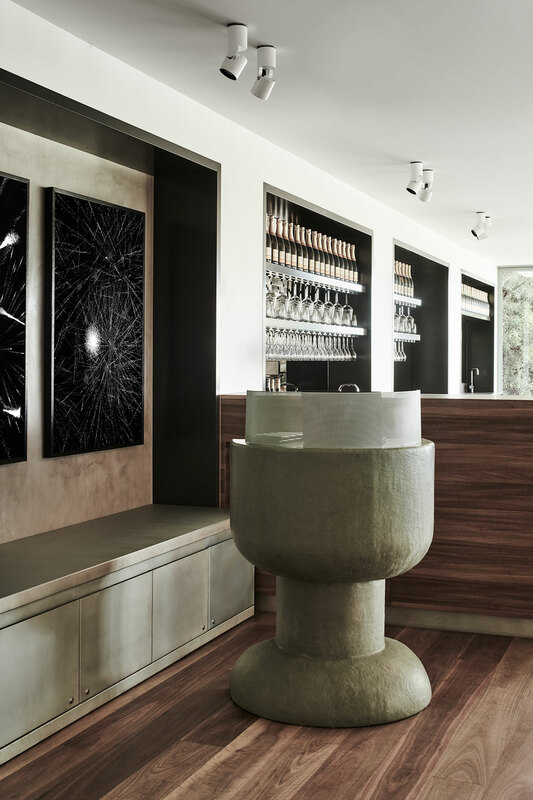 Is there a more perfect of enjoying wine? 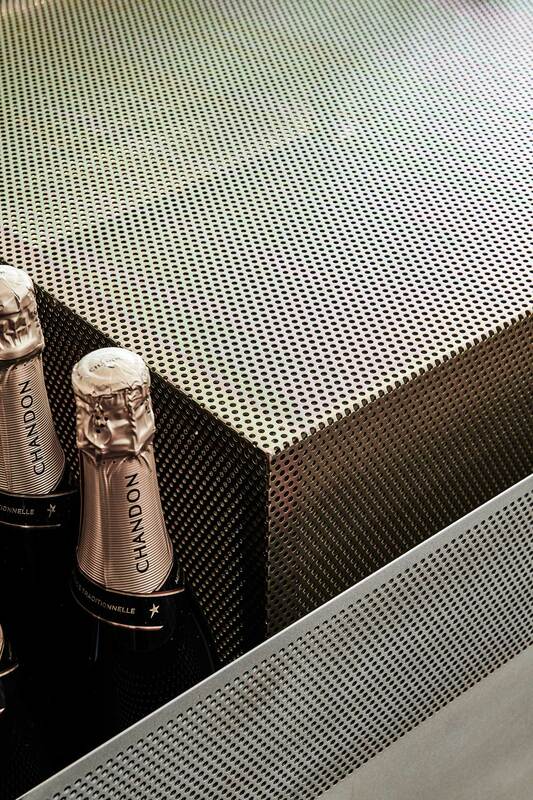 We seriously doubt it.